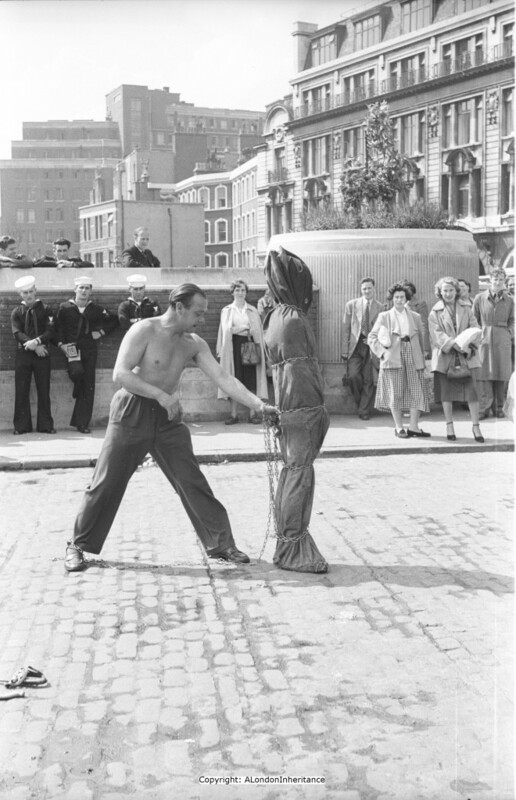 These photographs were taken on Tower Hill in the early 1950s, no later than 1953 and show Johnny Eagle, the Tower Hill Escapologist and Strong Man who performed on Tower Hill for many years. The following photograph is taken from almost the same viewpoint. The new Visitor Centre, built in 2004 covers the area where my father took the original photo so I could not get exactly the same perspective. 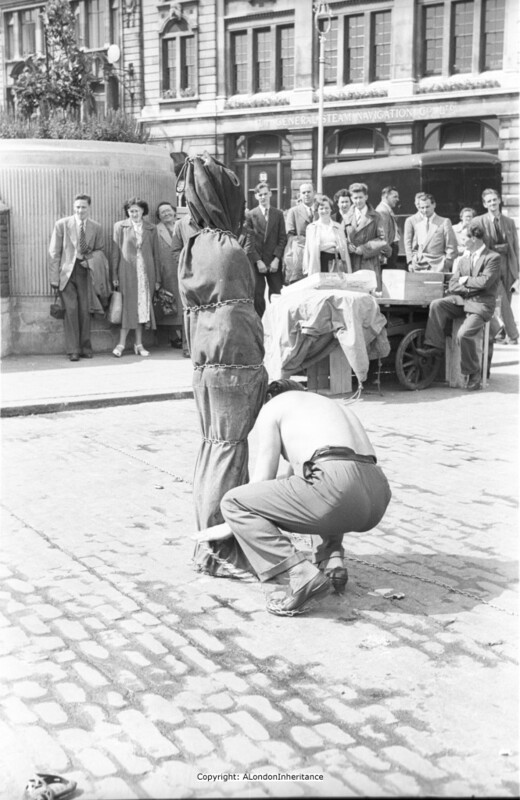 Johnny Eagle, the Tower Hill Escapologist, performed at Tower Hill for almost 20 years and was also to be found at other city locations across the country, such as the Birmingham Bull Ring. He was born circa 1916 and died in 2001 and was buried in Witton Cemetery near Birmingham. The white post at bottom right on the 2014 photo is a Tower of London Liberty Boundary Marker. As a royal palace and garrison, the Tower had a special administrative status for taxation and law enforcement from the middle ages to the late 19th Century. The markers ensured it was clear where the boundary between the authority of the City and the Tower was to be found. This photo is looking back towards the Tower. The Paynes Tea van is from George Payne & Co, a Tea Merchant based near Tower Bridge. The Company was involved with the development of tea brands for Sainsbury’s, which included the Red, Blue and Green labels that were launched at the opening of the Ealing branch of Sainsbury’s in 1903. George Payne & Co evolved into Finlays who still produce Sainsbury’s Red Label tea, although now from near Doncaster rather than central London. The following is looking back up Tower Hill towards the offices of the General Steam Navigation Company (GSN). The Company was founded in 1824 and ran steam ship services around the UK, near-Continental and to the Mediterranean. GSN ran the very popular London to Margate passenger service and for several years the annual number of passengers carried exceeded a million. Londoners escaping the city for the seaside! GSN continued through the 19th and 20th centuries running passenger and cargo services, but in 1971 the General Steam Navigation Company was fully purchased by P&O. This entry was posted in London Characters and tagged Johnny Eagle, Tower Hill, Tower Hill Escapologist on March 30, 2014 by admin. What a shame there aren’t any pictures of Johnny Eagle after he escaped from all those chains! 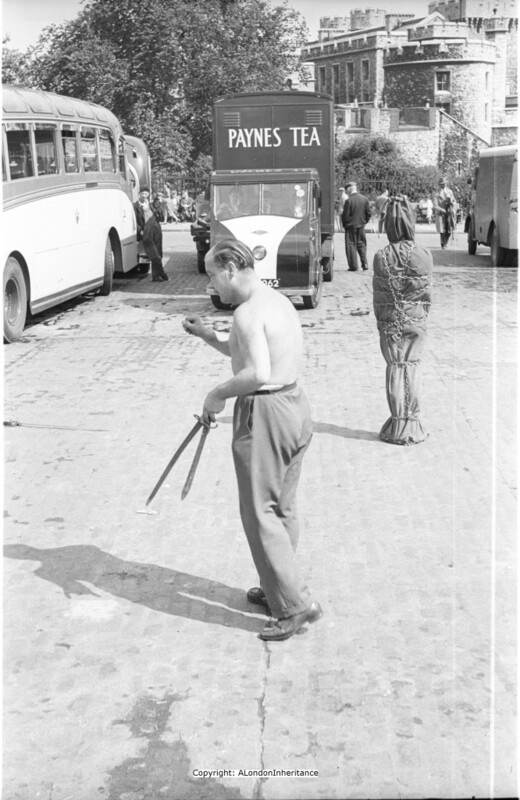 I like the typically London crowd standing behind, part amused, part sceptical, part curious….some things never change! I well remember going to the Tower of London with my dad and seeing the escapologist. I can remember so much detail about the act. A huge contrast to the sterile environment of Tower Hill today. Cracking website BTW. I will give it a mention on the blog. Hi Ray, thanks for the comment and I agree with you about Tower Hill. Thanks for the mention and you have a fascinating blog. I worked in Pepys Street, Tower Hill in the 60s and remember Johnny, every summer. Not just sword swallowing but also a long chain; he then asked members of the audience to listen to his stomach to hear the chain rattle! Also pushing long needles through his arms. The patter never altered, simply because it worked and allowed him to very successfully work the crowd. I recall him asking if anyone in the audience wanted to swallow the sword, in exchange for a sum of money. One responded that Johnny didn’t have the money to meet the challenge. I think that it was a son of Johnny who then pulled a thick wad of notes from his pocket; clear proof the act paid! Donald Soper, Baron Soper, was another regular crowd puller, on the Hill. The crowd particularly enjoyed his arguments with a local window cleaner, a communist prone to misquoting Marx. Soper could always correct the mistakes, but in good humour. Building the new Tower ticket offices cut off this once significant speakers platform. Very sad! Roy, that is really interesting, thanks. I can imagine what the patter with the crowd would have been like, and that it was very profitable. Agree with your comment about the ticket offices. 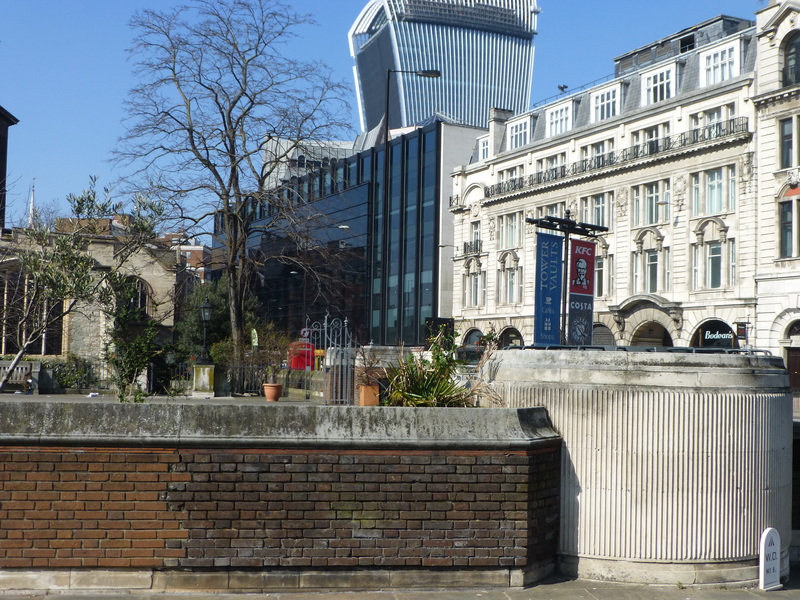 It worries me that places like Tower Hill are now designed for the high throughput of visitors, with the loss of local character, along with retail outlets commercialising the whole location. Back in the 60s, a Ministry of Public Buildings and Works season ticket cost 10/-, 50p. I used it to go into the Tower, several days a week, now £22! Seems that heritage is only for the tourist trade. In the 70s, the Wakefield Trust owned and Toc H ran a hostel on Trinity Square. Some 40 residents who were required to pay rent and to commit time to community. That, too, has gone and the area has become the City’s hotel quarter. Only the churches and pubs remain. I’m a member of St Olave’s and keep up my interest in the Hill where once I worked and lived. And another change is too much “private” land. One of the photos my father took in 1947 was of a heavily damaged All Hallows with the PLA building in the background. I was trying to get to the same position to take a photo now but was stopped by the buildings security despite the fact I was outside and not taking a photo of their building. Ah yes, an insurance company that insure, or used to, Huntingdon Life Scientists – animal testing. They got a bit paranoid about cameras, and those wielding them but probably with good reason. i remember them also in the early 70,s and used to go every week ( Wednesday i think ) in my lunch hour.I got friendly with and old guy there who was covered in tattoos and used to but him a cup of tea and talk about the old boxers .He brought with him one week some old newspaper cuttings and it turned out that he was once the most tattooed man in world,lovely guy but cant remember his name.